"Francis Stevens" redirects here. For other uses, see Francis Stevens (disambiguation). Gertrude Barrows Bennett (September 18, 1884 – February 2, 1948), known by the pseudonym Francis Stevens, was a pioneering author of fantasy and science fiction. Bennett wrote a number of fantasies between 1917 and 1923 and has been called "the woman who invented dark fantasy". Her most famous books include Claimed (which Augustus T. Swift, in a letter to The Argosy called "One of the strangest and most compelling science fantasy novels you will ever read")[a] and the lost world novel The Citadel of Fear. Gertrude Mabel Barrows was born in Minneapolis in 1884, to Charles and Caroline Barrows (née Hatch). Her father, a Civil War veteran from Illinois, died in 1892. Gertrude completed school through the eighth grade, then attended night school in hopes of becoming an illustrator (a goal she never achieved). Instead, she began working as a stenographer, a job she held on and off for the rest of her life. In 1909 Barrows married Stewart Bennett, a British journalist and explorer, and moved to Philadelphia. A year later her husband died during a tropical storm while on a treasure hunting expedition. With a new-born daughter to raise, Bennett continued working as a stenographer. When her father died toward the end of World War I, Bennett assumed care for her invalid mother. During this time period Bennett began to write a number of short stories and novels, only stopping when her mother died in 1920. In the mid-1920s, she moved to California. Because Bennett was estranged from her daughter, for a number of years researchers believed Bennett died in 1939 (the date of her final letter to her daughter). However, new research, including her death certificate, shows that she died in 1948. Gertrude Mabel Barrows (as she then was) wrote her first short story at age 17, a science fiction story titled "The Curious Experience of Thomas Dunbar". She mailed the story to Argosy, then one of the top pulp magazines. The story was accepted and published in the March 1904 issue, under the byline "G.M. Barrows". Although the initials disguised her gender, this appears to be the first instance of an American female author publishing science fiction, and using her real name. Once Bennett began to take care of her mother, she decided to return to fiction writing as a means of supporting her family. The first story she completed after her return to writing was the novella "The Nightmare," which appeared in All-Story Weekly in 1917. The story is set on an island separated from the rest of the world, on which evolution has taken a different course. "The Nightmare" resembles Edgar Rice Burroughs' The Land That Time Forgot, itself published a year later. While Bennett had submitted "The Nightmare" under her own name, she had asked to use a pseudonym if it was published. The magazine's editor chose not to use the pseudonym Bennett suggested (Jean Vail) and instead credited the story to Francis Stevens. When readers responded positively to the story, Bennett chose to continue writing under the name. Over the next few years, Bennett wrote a number of short stories and novellas. Her short story "Friend Island" (All-Story Weekly, 1918), for example, is set in a 22nd-century ruled by women. Another story is the novella "Serapion" (Argosy, 1920), about a man possessed by a supernatural creature. This story has been released in an electronic book entitled Possessed: A Tale of the Demon Serapion, with three other stories by her. Many of her short stories have been collected in The Nightmare and Other Tales of Dark Fantasy (University of Nebraska Press, 2004). 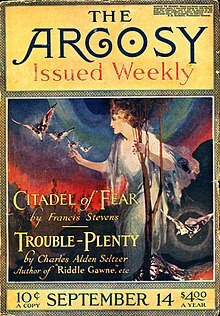 In 1918 she published her first, and perhaps best, novel The Citadel of Fear (Argosy, 1918). This lost world story focuses on a forgotten Aztec city, which is "rediscovered" during World War I. It was in the introduction to a 1952 reprint edition of the novel which revealed for the first time that "Francis Stevens" was Bennett's pen-name. A year later she published her only science fiction novel, The Heads of Cerberus (The Thrill Book, 1919). One of the first dystopian novels, the book features a "grey dust from a silver phial" which transports anyone who inhales it to a totalitarian Philadelphia of 2118 AD. Apparently The Thrill Book had accepted more of her stories when it was cancelled in October 1919, only seven months after the first issue. These were never published and became lost. Bennett has been credited as having "the best claim at creating the new genre of dark fantasy". It has been said that Bennett's writings influenced both H. P. Lovecraft and A. Merritt, both of whom "emulated Bennett's earlier style and themes". Lovecraft was even said to have praised Bennett's work. However, there is controversy about whether or not this actually happened and the praise appears to have resulted from letters wrongly attributed to Lovecraft. As for Merritt, for several decades critics and readers believed "Francis Stevens" was a pseudonym of his. This rumor only ended with the 1952 reprinting of Citadel of Fear, which featured a biographical introduction of Bennett by Lloyd Arthur Eshbach. Critic Sam Moskowitz said she was the "greatest woman writer of science fiction in the period between Mary Wollstonecraft Shelley and C.L. Moore". Because Bennett was the first American woman to have her fantasy and science fiction widely published, she qualifies as a pioneering female fantasy author. Claimed (1920; reprinted in 1985, 1996, 2004, 2018) 192pp, cloth and paper, Sense of Wonder Press, James A. Rock & Co., Publishers in trade paperback and hard cover. ^ a b Swift was at one time thought to be a pseudonym of H.P. Lovecraft but this has been proven spurious. He was a real individual in Providence. See the section Influence for more detail. Rock Publishing attributes the quotation to Lovecraft. ^ a b c d e f g h i j k l Partners in Wonder: Women and the Birth of Science Fiction, 1926-1965 by Eric Leif Davin, Lexington Books, 2005, pages 409-10. ^ a b Nicholls, Peter; Clute, John (1993). The Encyclopedia of Science Fiction. St. Martin's Press. pp. 1164–65. ISBN 0-312-13486-X. .
^ a b (promotional page). ""Claimed"". James A. Rock and Company Publishers. Archived from the original on 2003-07-18. Retrieved 2007-05-16. ^ The Cambridge Companion to Science Fiction by Edward James and Farah Mendlesohn, Cambridge University Press, 2003, page 30. ^ a b Survey of Modern Fantasy Literature by Frank Northen Magill, Salem Press, 1983, page 287. ^ a b T. M. Wagner. "Review of Francis Steven's Claimed". SF reviews.net. Retrieved 2007-05-16. ^ Women in Science Fiction and Fantasy edited by Robin Anne Reid, Greenwood, 2008, page 289. ^ An H.P. Lovecraft Encyclopedia edited by S. T. Joshi, David E. Schultz, Greenwood Publishing Group, 2001, page 218. ^ "Introduction to Citadel of Fear" by Lloyd Arthur Eshbach, Citadel of Fear by Francis Stevens, Polaris Press, 1952. ^ Note: all short story information comes from "The Fiction Mags Index". Archived from the original on 2009-07-03. Retrieved 2009-03-31. R. Alain Everts. "The Mystery of Francis Stevens (1883–1948)". Outsider 4 (2000): 29–30. Bryce J. Stevens. "Into the Abyss: Did Francis Stevens' 1920 Novel Claimed Influence H.P. Lovecraft?". [clarification needed] Presents textual evidence that Claimed may have influenced "The Call of Cthulhu". Sam Moskowitz. "The Woman Who Wrote 'Citadel of Fear'". The Citadel of Fear by Francis Stevens. NY: Paperback Library, 1970. Robert Weinberg. "A Forgotten Mistress of Fantasy". The Citadel of Fear by Francis Stevens. NY: Carroll & Graf, 1994.